NOTE: Updated 4/1/2014 with longer cooking times for better results. 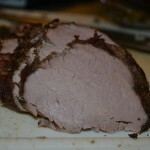 Start with a good inner round roast. The less marbling the better since we are going for a “tenderloin like” texture. I usually get the 2 pack from Costco for around $20. Vacuum seal with a bit of garlic, onion, fresh ground pepper, your favorite steak spice, and a bay leaf. Cook in a water oven for around 24 hours at 136F. I find 136F a bit too rare for my tastes, but since we are going to finish it in the oven we want it slightly rare. 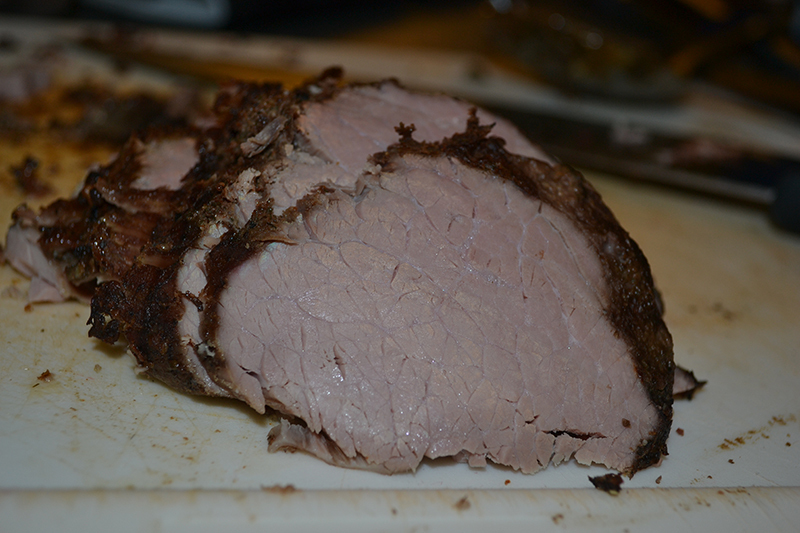 Originally I was cooking my roasts for 6-8 hours, but 18-24 hours yields a roast that is MUCH more tender. Preheat over to 450F with an oven safe grilling pan inside during the preheat. 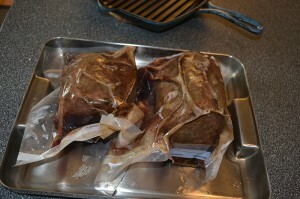 Transfer the roast from the vacuum bag to the grilling pan (a note to keep the oven mitts on at this stage since I know from experience its possible to forget that the innocent looking grilling pan sitting on the counter has been preheated). 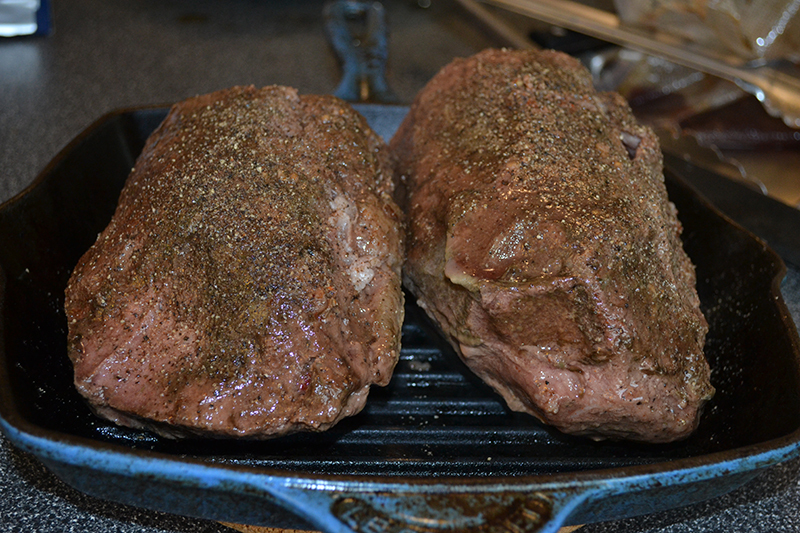 Put the grilling pan in the 450C oven (use convection roast if you have it) for 5 mins. After 5 mins flip the roast oven and cook for another 5 mins – 10 mins depending on the size of the roast. 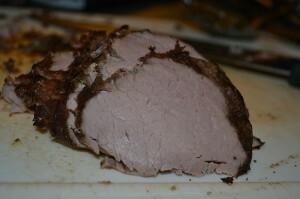 You want the roast to be totally crusted over and any fat crackling before you take it out. Finish with putting the fatty side of the meat down to sear it. A note at this point that some sous vide purists would shudder at the idea of cooking the roast for 10-15 mins instead of using a torch or other more rapid method of inducing a Maillard reaction. With roasts I find the 10-15 minute finish in the oven with a slightly rare roast does a much better job of getting the fats to render with the longer, higher temp without raising the internal temp significantly or changing the overall texture of the meat.